Have you ever been on a date and wished you had a restaurant tipping chart? Knowing whom to tip and how much to give can be nerve-wracking when you aren't sure of what you're doing. It's even worse when your date is standing right there next to you. There is certain embarrassment when getting conversation started by asking how much to tip. He or she may come away with an unfavorable impression if you mess up the tip. It's much easier to look at a chart or use a tip calculator instead of doing math in your head. Figuring out a tip when you're on a date and nervous can cause extra stress. If you are one of those people, refer to the handy restaurant tipping chart for 15% and 20% tips to help you determine how much to tip. If you take your date to a fancy restaurant, you'll be faced with tipping situations long before the meal is served. Here is a run-through of a possible visit to a nice restaurant. Valet parking - If you use valet parking, you should tip at least $2. However, you tip when you pick up your car, not when you drop it off. Keep your small bills handy, but don't start pulling them out yet. Taking your coat - If the restaurant has a coat check where they hang your coat for you while you are eating, the tip is usually $1 per coat. But just like valet, you pay when you pick up, not when you drop off. Sitting at the bar - If you sit at the bar before sitting down at your table, you'll need to tip the bartender before leaving the bar. There are fewer rules for tipping at a bar than for your meal. If you just order a beer, you could get away with a 50 cent tip, but $1 may be more appropriate. For cocktails or more difficult orders, you should look at tipping $2. Of course, if the bartender is extra-friendly and creatively pours your drink, reward his or her efforts. Going to your table - You do not tip the restaurant hostess or host who leads you to your table. 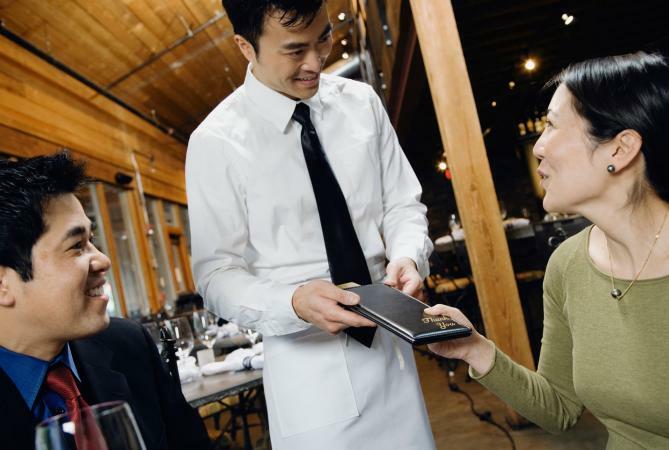 However, if you made a special request for a certain table or area of the restaurant, or if you were able to move up the wait-list line, a tip is appropriate. Using the restroom - You'd think that using the facilities would be the one area where you are free from the burden of tipping. Well, sometimes you are, but if there is an attendant there who gets you a towel, shines your shoes or performs any other services, you'll need to tip him or her also. Remember to bring some dollar bills with you when you use the restroom. When the check comes - Tipping 15% is still the golden rule of tipping. To reward really good service, 20% should be given instead. If the bus-person was really attendant to your table, remember that they get a percentage of the tip you give to the waiter or waitress, so good service from them may warrant a higher tip. Being out on a date is no time to get stingy with your tips. Your date is likely watching how much you tip very closely to learn more about your personality. Consider a good tip to be both a courtesy and a dating rule. The 15 or 20 percent tip is before taxes, not after taxes. You are always welcome, however, to tip based on the full amount of the bill. If you order wine and it's brought to your table by the wine steward, you'll need a separate tip for him or her that is based on the cost of the bottle of wine. To quickly determine how much a 15% tip is, figure out what 10% of the bill is, then add half of that total to the 10% figure. Calculating a 20% tip is even easier. For every $5 on the bill, leave a $1 tip. When you're on a date, you don't want to commit a faux pas when tipping. If you're just getting to know someone, it's better to err on the side of caution rather than potentially offend someone who may have held a serving job in the past or considers it an indication of your character.